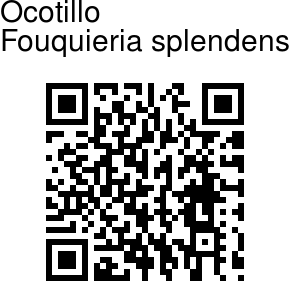 Ocotillo is a catcus-like plant, although not a true cactus. For much of the year, the plant appears to be an arrangement of large spiny dead sticks. However, the stems are partly green. With rainfall the plant quickly becomes lush with small, 2-4 cm, ovate leaves, which may remain for weeks or even months. Individual stems may reach a diameter of 5 cm at the base, and the plant may grow to a height of 10 m. The plant branches very heavily at its base, but above that the branches are pole-like and only infrequently divide further, and specimens in cultivation may not exhibit any secondary branches. The leaf stalks harden into blunt spines, and new leaves sprout from the base of the spine. The bright crimson flowers appear especially after rainfall in spring, summer, and occasionally fall. Flowers are clustered indeterminantly at the tips of each mature stem. Individual flowers are mildly zygomorphic and are pollinated by hummingbirds and native carpenter bees. 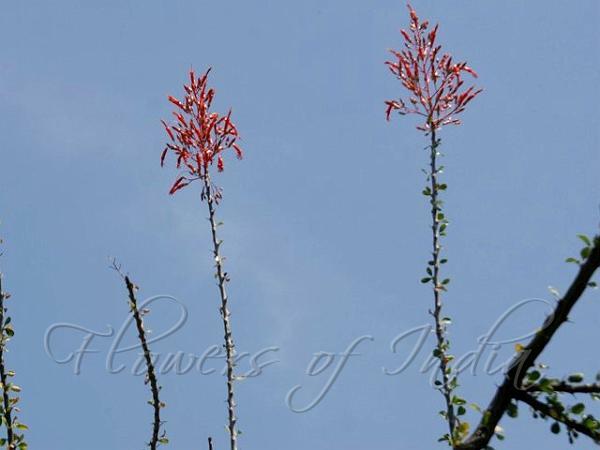 Ocotillo is native to the southwestern United States and northern Mexico. It is a cultivated garden plant in India.